The Horticulture Centre of the Pacific. 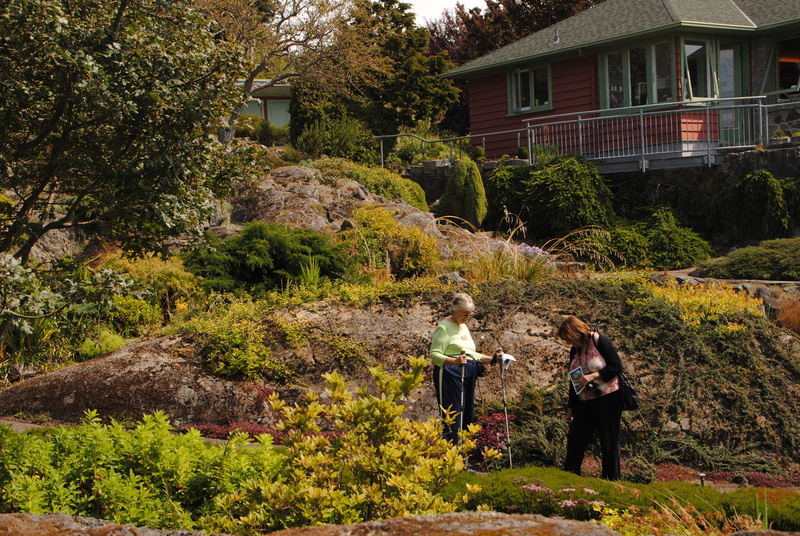 Our last day of gardens on Vancouver Island turned out to be a high point. We started the day at the Horticulture Centre of the Pacific. This educational garden is maintained by 10 month student interns who learn how to garden as a trade before spreading out to work in the many gardens around Vancouver Island (Victoria touts itself as “City of Gardens”). The gardens were quite lovely with about 30 theme gardens from bogs to Japanese gardens, vegetables, and fuchsia collections. The garden art was quite nice throughout the grounds. Iron Allium christophii flowers at the Hort. Center of the Pacific. 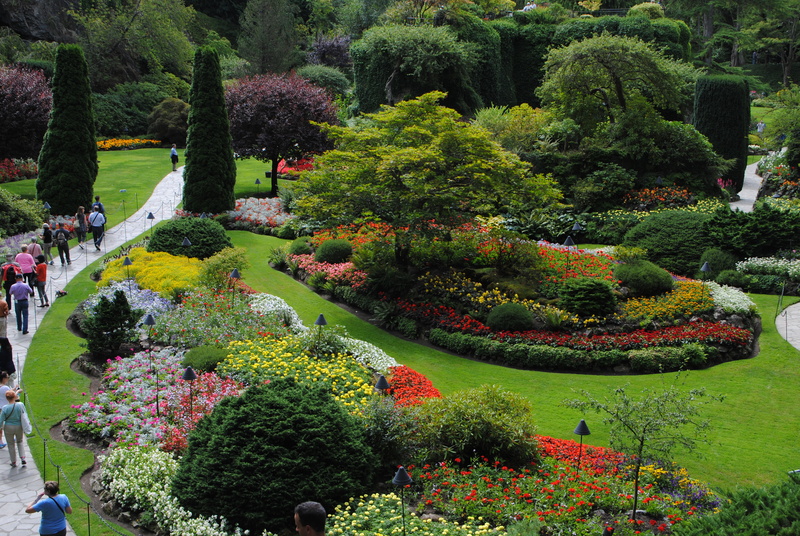 The final garden was The Butchart Gardens, a must-see for any visitor to the island. 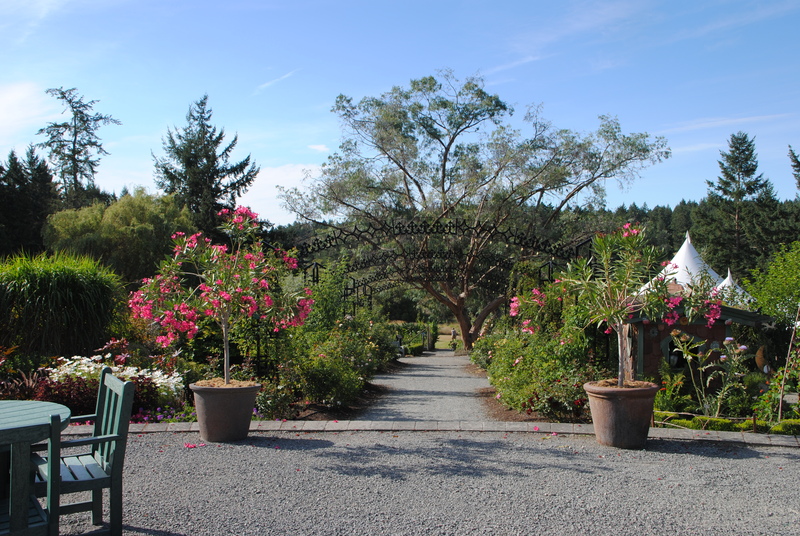 The hanging baskets, color plantings, and general exuberance of the gardens make this a great place to visit for both gardeners and non-gardeners alike. 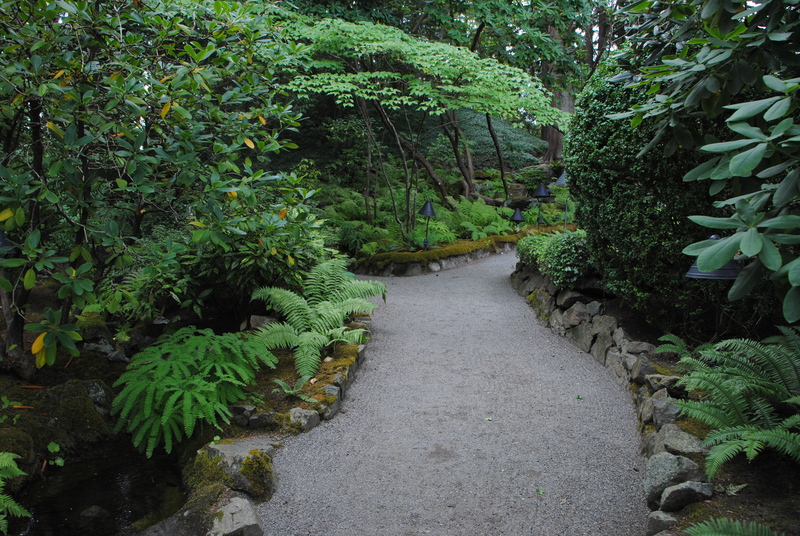 I appreciated some of the more understated areas like the Japanese Garden where moss and ferns gave a serene, green look. 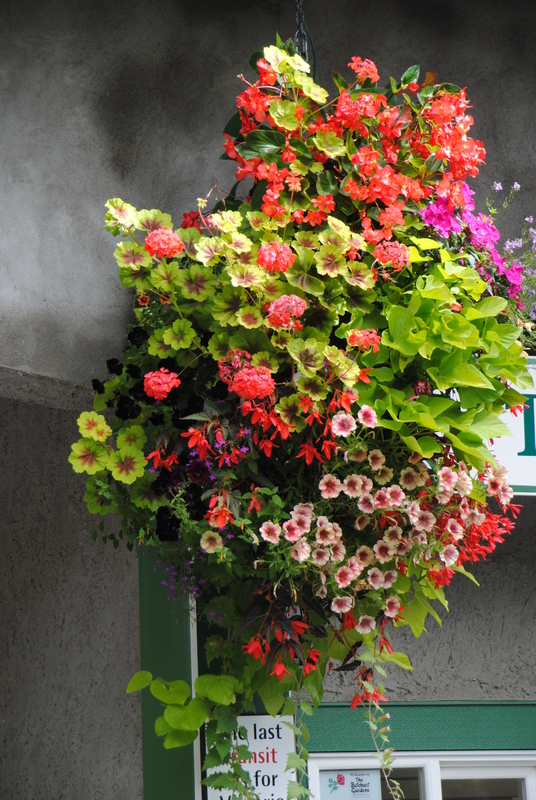 Brilliant hanging baskets are everywhere. Bright color in the Quarry Garden at Butchart. 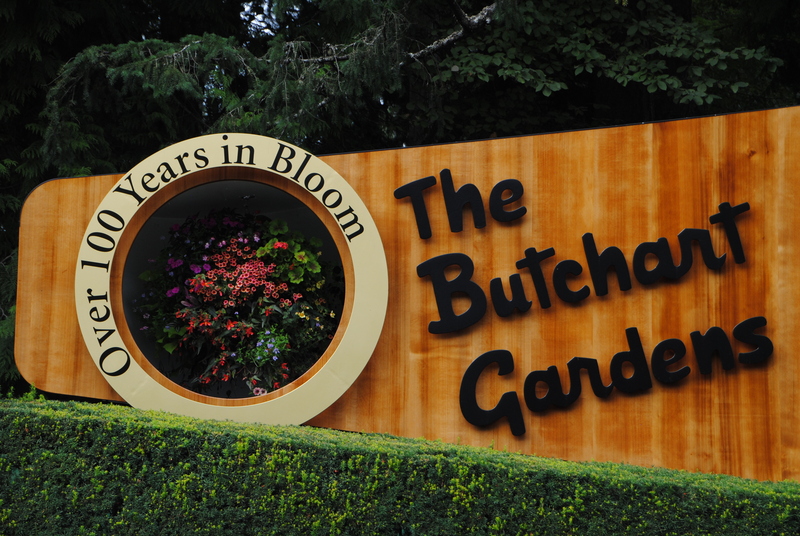 Apparently tours are not allowed at Butchart Gardens (they even explicitly prohibit guided tours on the tickets) but the JC Raulston name once again paid off. 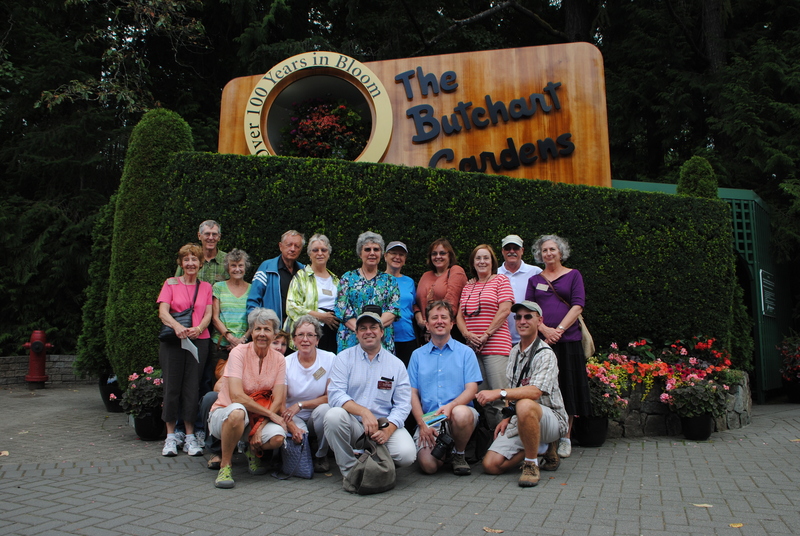 We were given a private tour by Rick Gordon who has been working at Butchart for 30 years. Despite his length of service, this was Rick’s very first tour – which he led excellently I should add. He told us that they will give maybe 10 or so guided tours a year. We even got to peak into the greenhouses where they produce their fantastic plants. A serene break from all the exuberant color. 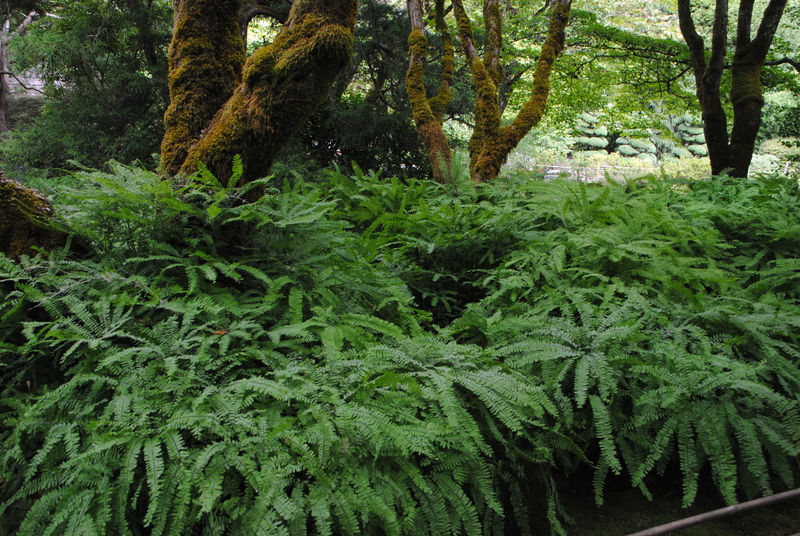 Massive maidenhair ferns in the Japanese Garden. 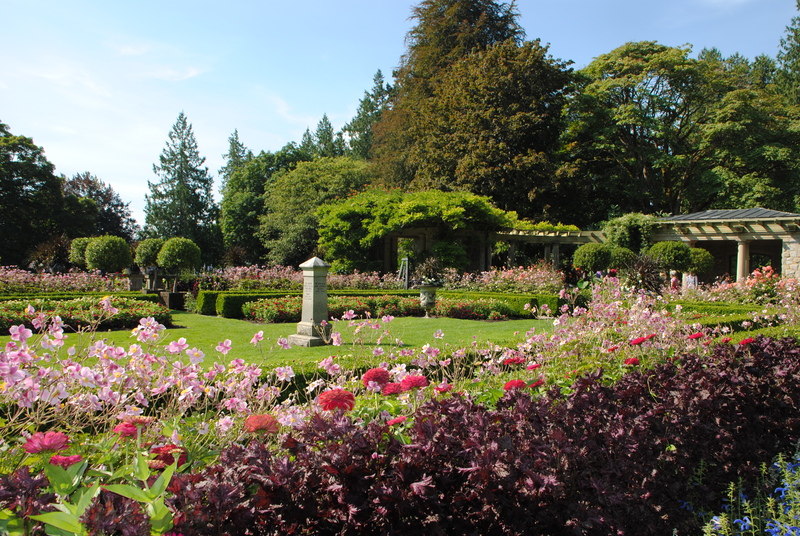 Our Great 70 Degree British Columbia Getaway has been a phenomenal trip with a great group of people, exquisite gardens, and knowledgeable guides. I can’t wait for the next trip. A great trip with a great group. This entry was posted in Travels and tagged butchart gardens, hanging baskets, Horticulture centre of the pacific, quarry garden, rick gordon, Vancouver on August 24, 2013 by Mark Weathington. Thanlictrum delavayi anchoring one end of a Government House Border. The bustling harbor just outside our hotel starts early in the morning much like our crew. 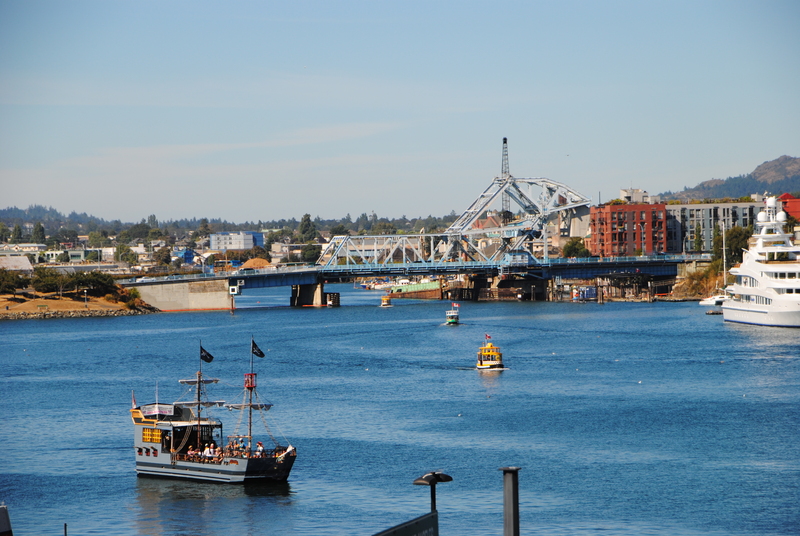 Seaplanes were getting ready for tourists, sailboats were heading out, and ferries were preparing for crowds. 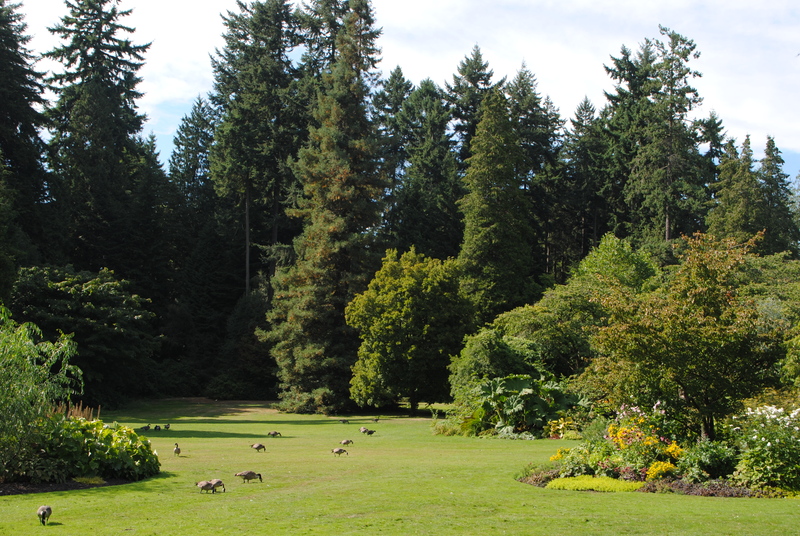 We left for Hatley Castle Gardens on what is now the grounds of the Royal Roads University. The house was originally built by the man who owned all the coal mines on the island who decided he needed a castle. It was eventually sold to the Canadian navy who used it as a naval academy before it ultimately turned into a university. Barrie showing us around Hatley Castle. Our guide Barrie, the head gardener, was a wealth of information about the house and grounds. There were incredibly well-maintained and interesting formal gardens, a Japanese garden, rose and walled gardens and woodland ferneries. The diversity was really quite nice and while some of the gardens are in need of renovation, the majority were quite beautiful and filled with fantastic plants. 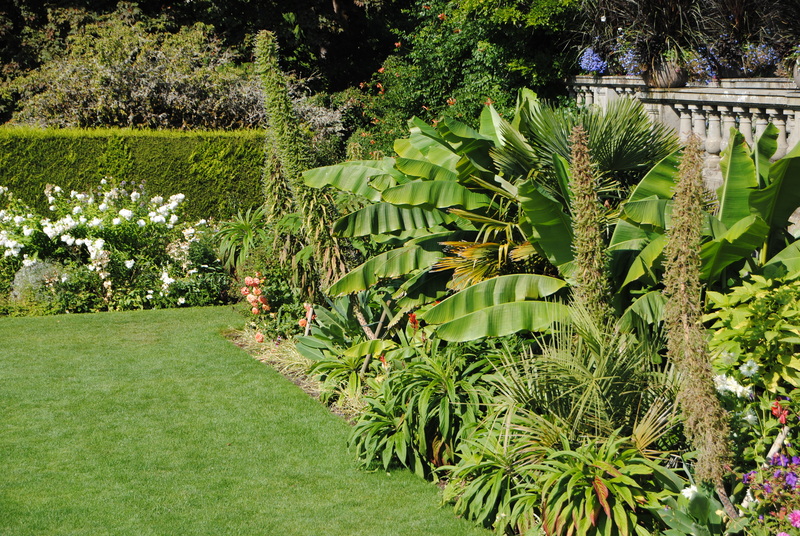 Part of the sub-tropical border. A formal Italianate garden at Abkhazi. After a quick lunch we were on our way to the Abkhazi Garden which is a wonderful oasis in a surburban neighborhood. The house and garden are built among and on solid stone outcrops where paths and plants blend seamlessly with the rock. 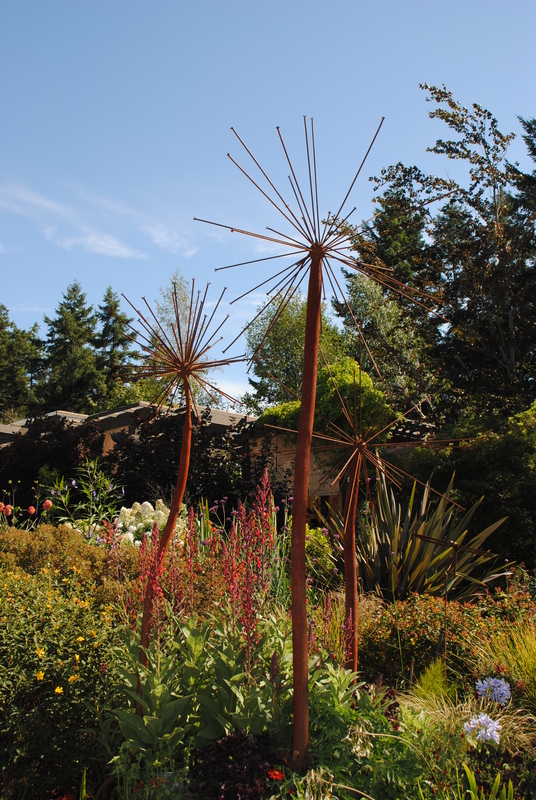 The garden combines 100 year-old rhododendron with unusual plants from around the world including new cultivars and unusual species. Nancy and Claire exploring Abkhazi. A pond nestled into the rock outcrop at Abkhazi. The winding turf lawn at Abkhazi represents the Yangtze river. Our plan was to finish the day at Beacon Hill Park, a public park near our hotel. Based on a tip from a couple of Abkhazi volunteers, we instead headed to Government House – the residence of the Lieutenant Governor, the official representative of England when she (or he) is in town. The grounds are open to the public and were simply spectacular. 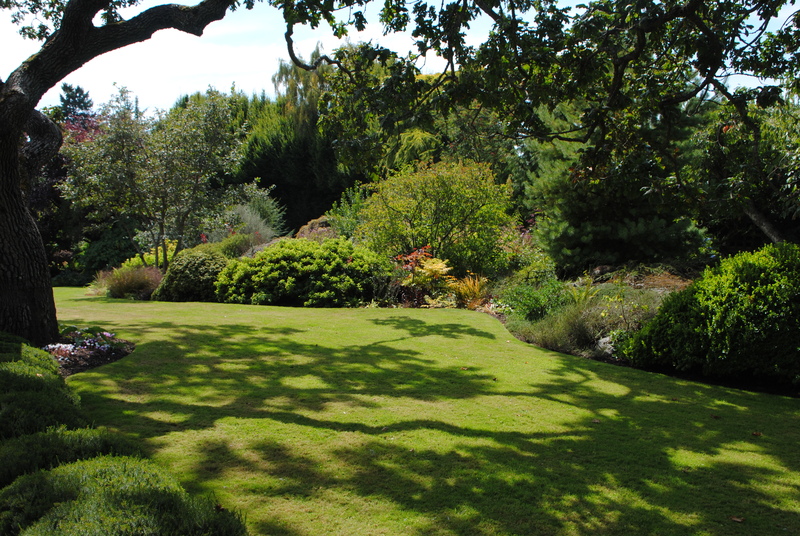 The house is on top of a hill over Victoria and has lush borders, rock gardens, herb and rose gardens, and quite a few acres of endangered Garry oak (Quercus garryana) ecosystem. One of the lovely borders at Government House. 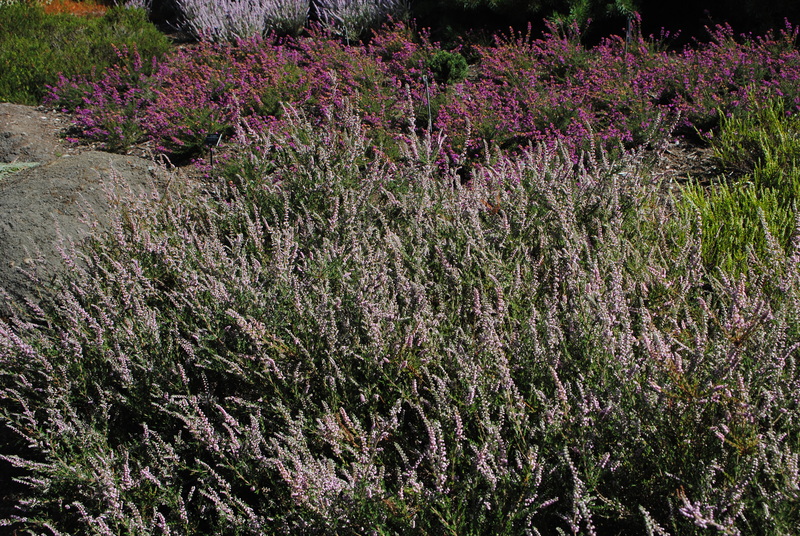 Part of the dry garden at Government House. 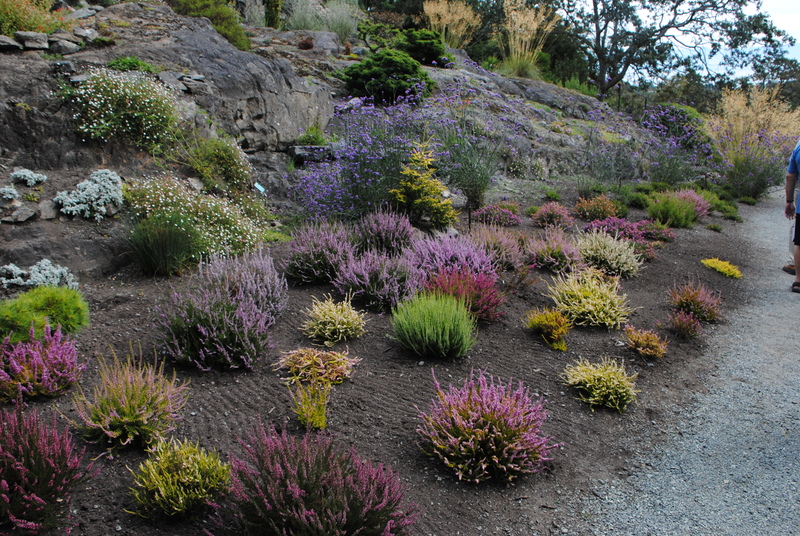 A newly planted heath garden below the rock garden. 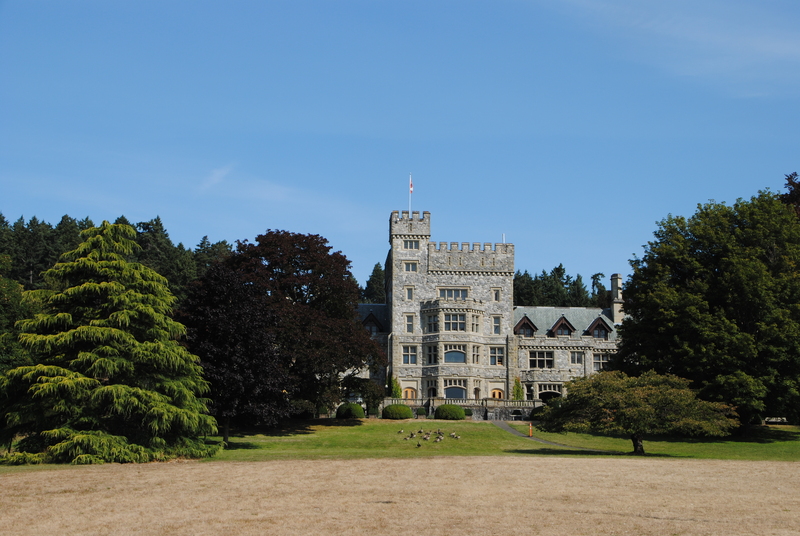 This entry was posted in Travels and tagged Abkhazi, Government House, Hatley Castle, Vancouver Island, Victoria on August 23, 2013 by Mark Weathington. 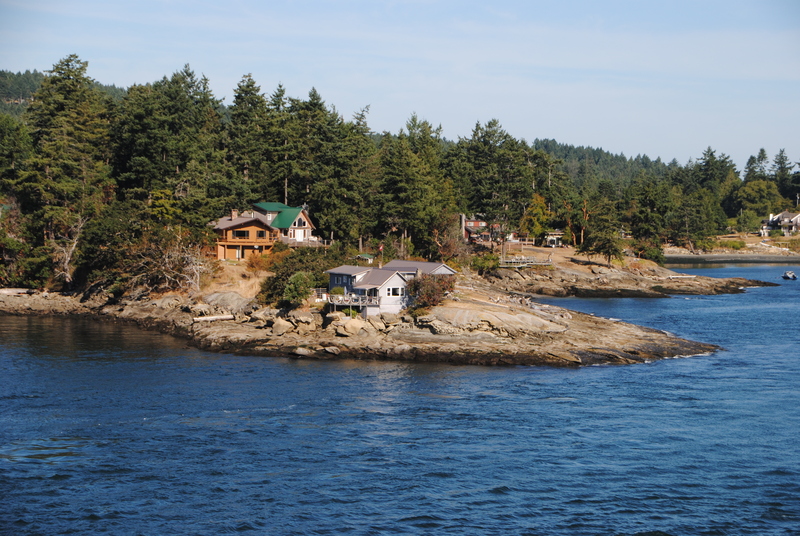 The 500′ ferry to Vancouver Island. We were up early to make it to the ferry from Vancouver to Vancouver Island and on to Victoria, our base for the next several days. 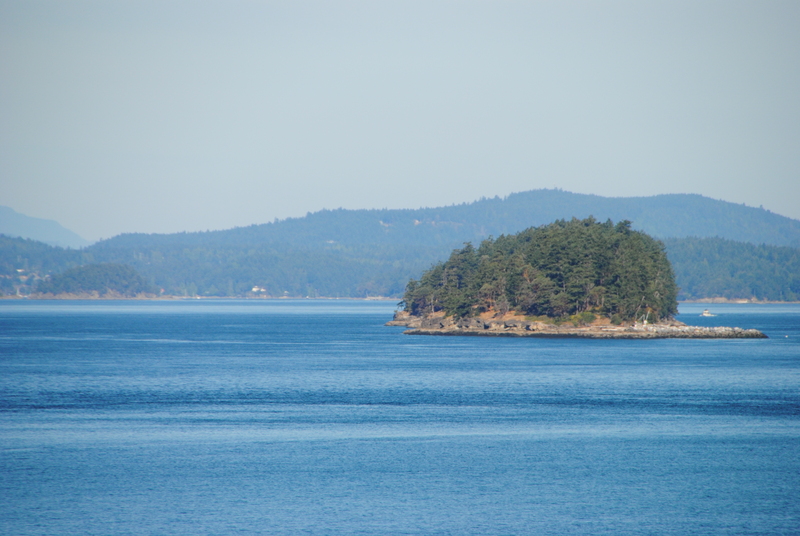 The ferry ride is an amazing trip with incredible views as you weave between rocky islands covered with madrone (Arbutus menziesii) and conifers. 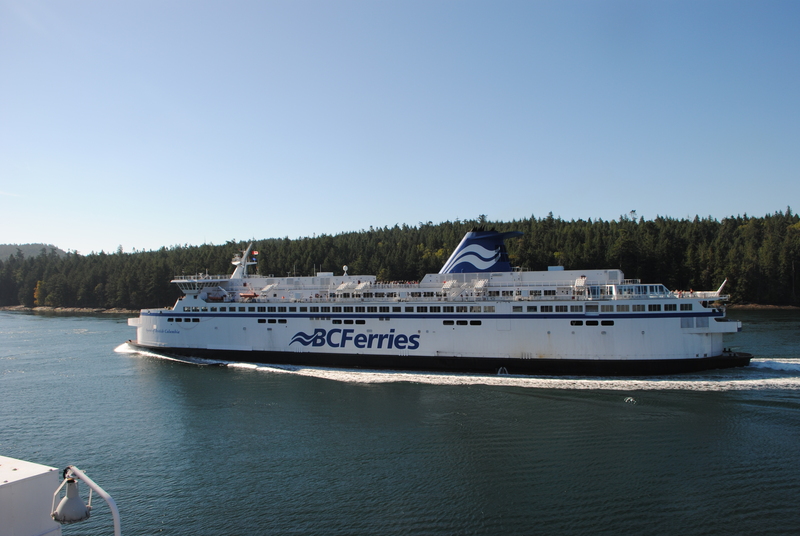 The ferry from Tsawwassen to Swartz Bay is about 550′ feet long and holds over 2000 people and 400 cars so it isn’t a small vessel and seems much too big to wind its way between the islands. Despite a constant look-out no whales, otters, or seals were seen. Part of the narrow passage for the ferry. This was one of our few free afternoons so after we arrived at the hotel a bit before lunch, folks split up to explore Victoria, visit some provincial parks, and even golf. Unfortunately a free afternoon means I get to sit in a hotel room and do work. Whale watching is on the agenda for later for some of the group but I will get to continue to do work. I suppose the view of the harbor makes up for it. The view of the harbor outside my window – not bad. 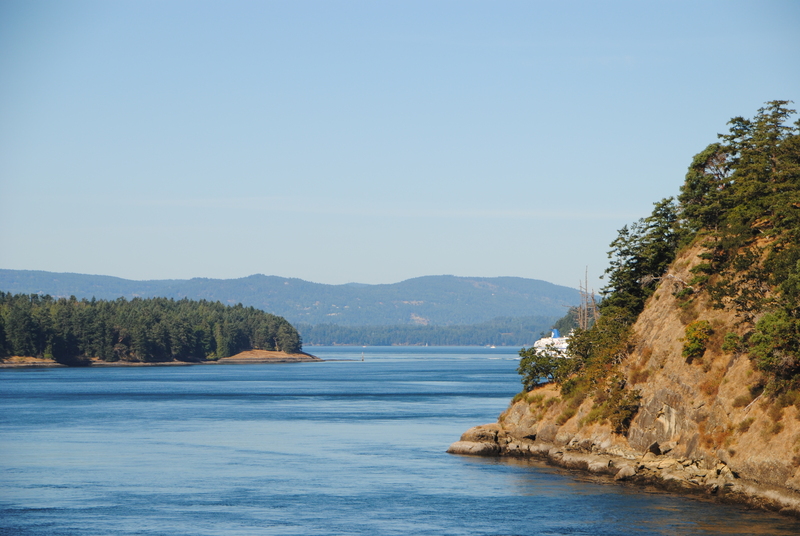 This entry was posted in Travels and tagged ferry, swartz bay, tsawwassen, Vancouver, vncouver island on August 22, 2013 by Mark Weathington. Part of a great art display at Van Dusen called Touch Wood. 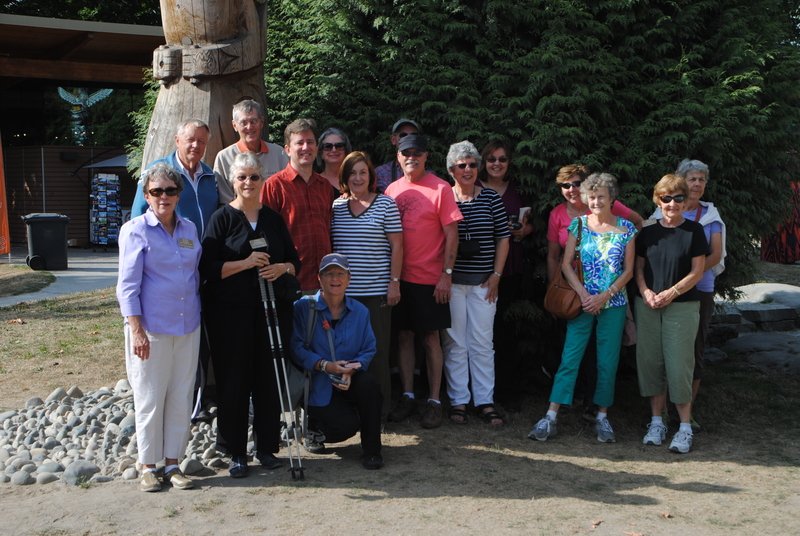 Day 3 of the JC Raulston Arboretum excursion to British Columbia lived up to the high bar set by our first couple of days with incredible gardens and fantastic tours. 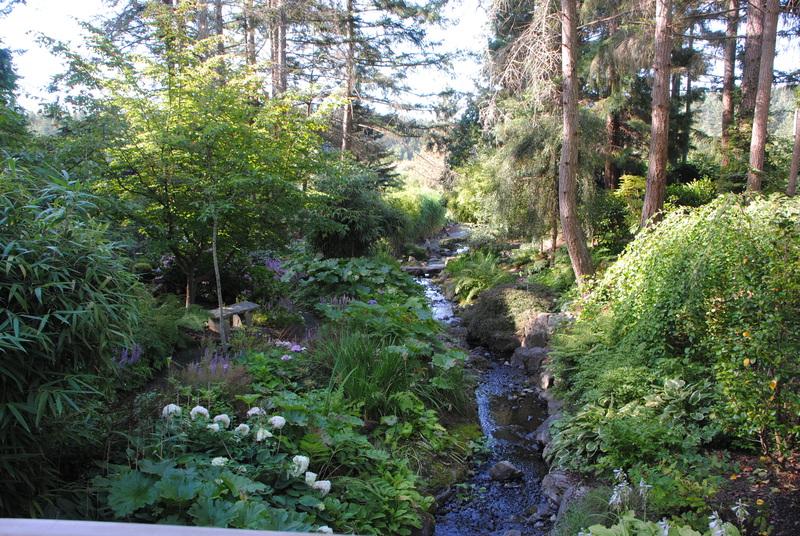 We started early with a visit to Van Dusen Botanical Garden. On my last trip to the area (almost a decade ago now!) this garden really blew me away. There were some big changes including a 22 million dollar, LEED certified visitor center. 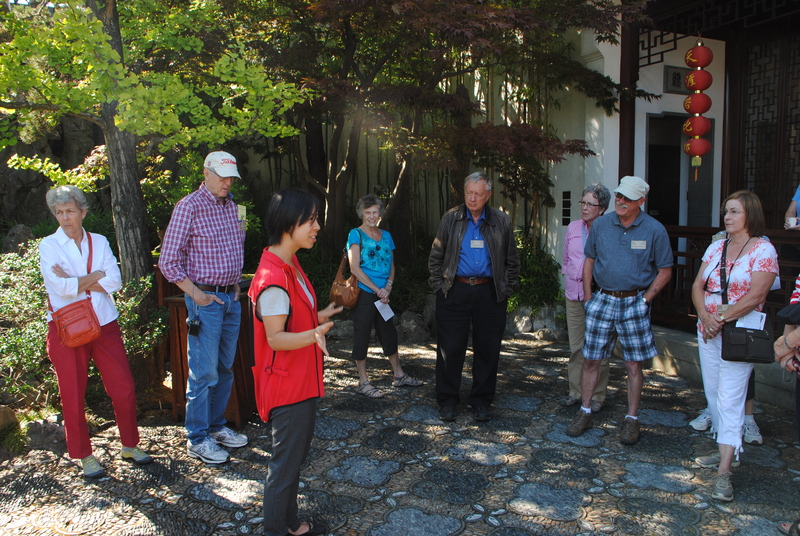 Beryl, curator for Van Dusen, took us on a tour of the grounds with some of her colleagues and treated us to a 2 hour in-depth look at the collections. The grounds were spectacular, much as I remembered them. 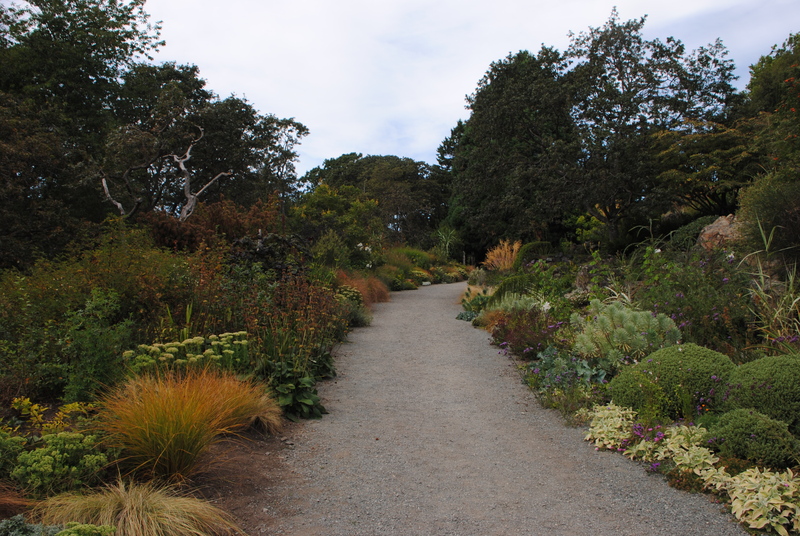 The mixed borders of perennials and subtropicals were especially showy. 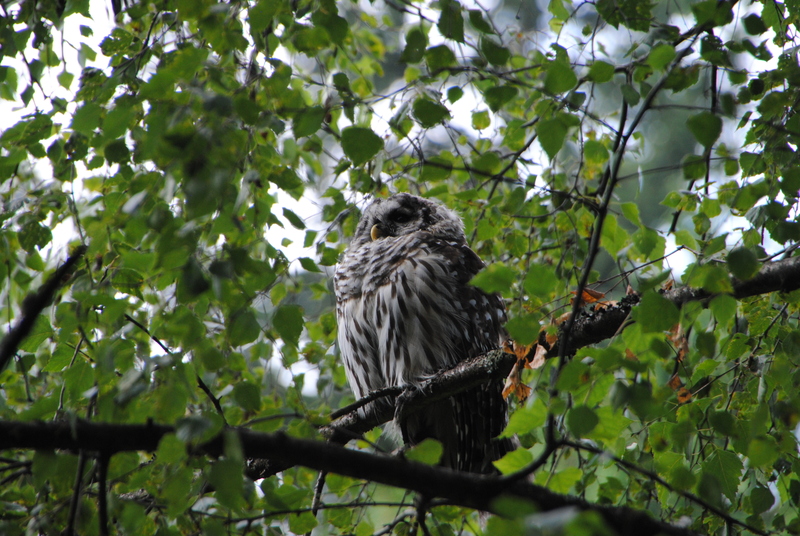 Barred owl at Van Dusen. 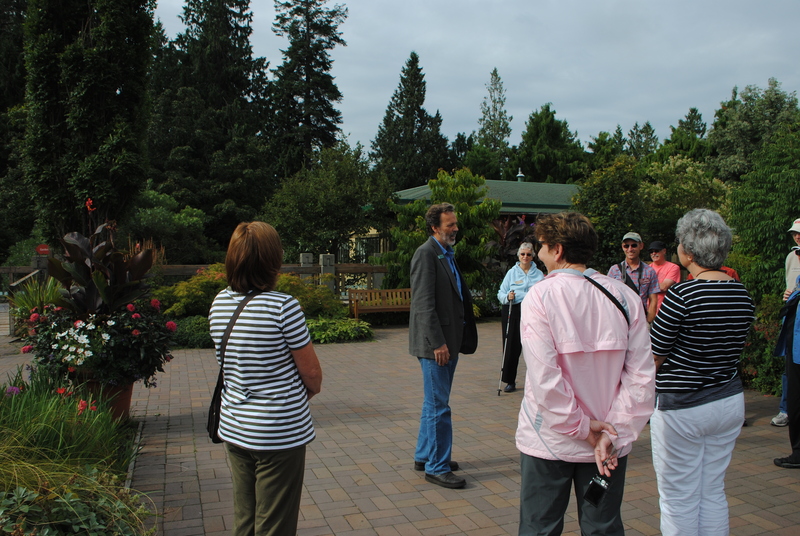 Beryl, the curator at Van Dusen, gave a fantastic tour with a couple of colleagues. The heath surprised me with flowers in August. 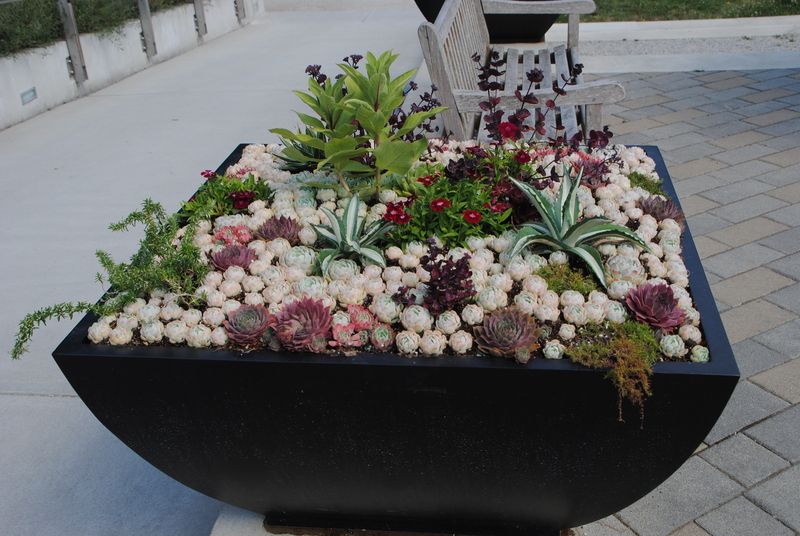 A lovely container at Van Dusen. 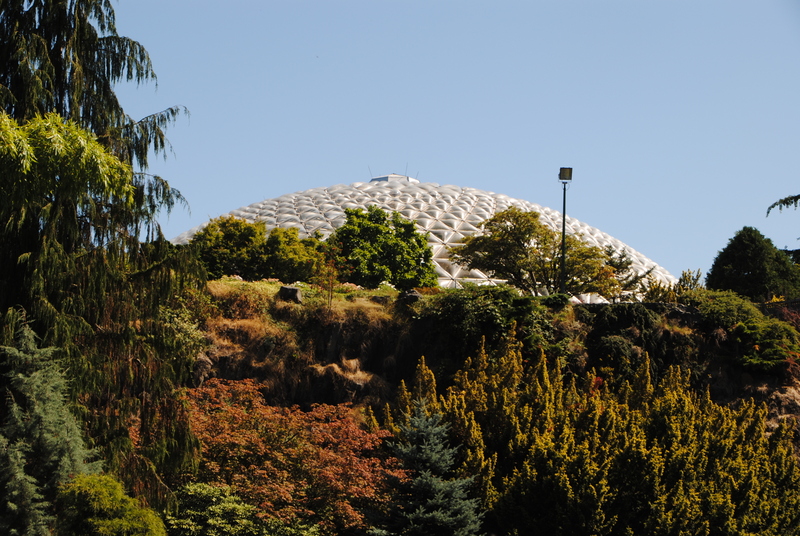 The dome of the Bloedel Conservatory. 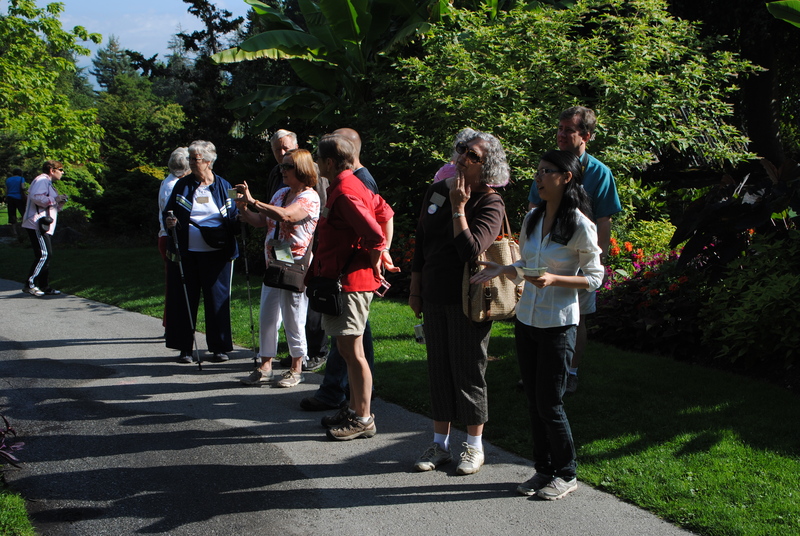 After a quick lunch we headed the short distance to Queen Elizabeth Park and Bloedel Conservatory. 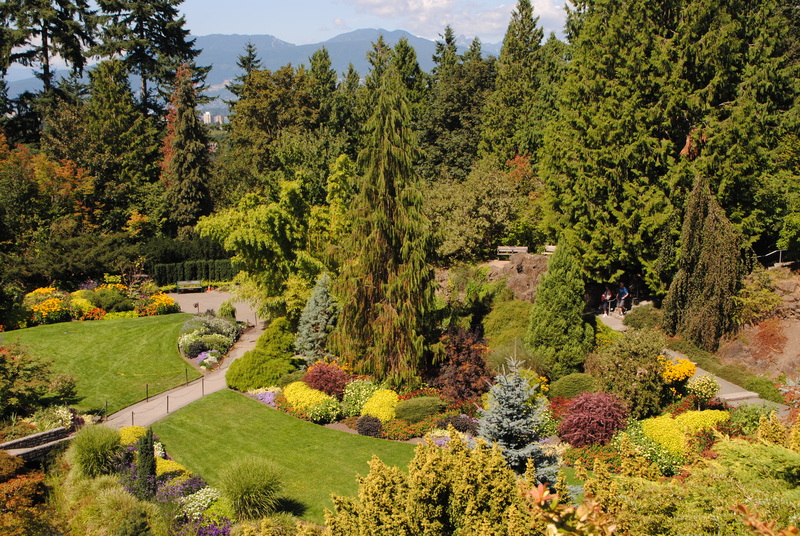 Vancouver has way more than its fair share of parks and botanic gardens and our 2 garden visits were only a half mile apart. 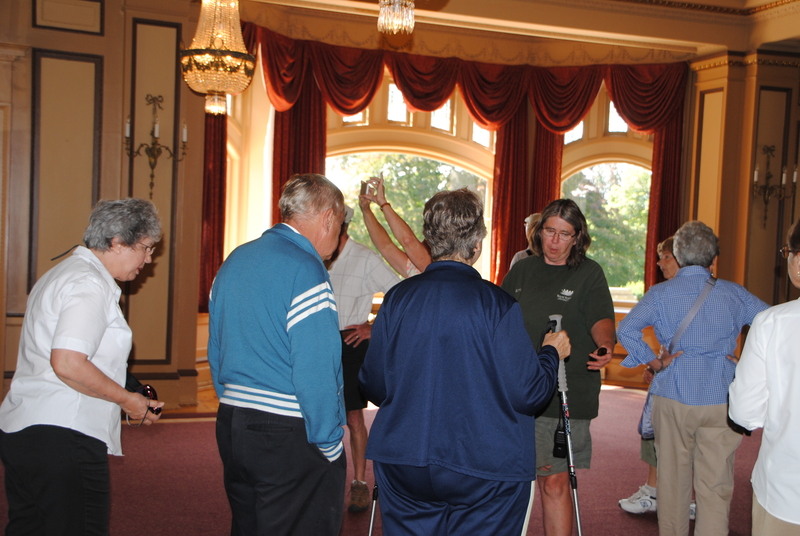 The tour of the conservatory was given by a parks intern named Dan. Dan had not been working in the conservatory for long but gave a great tour anyway. The internship program is a highly competitive one that lasts 4 years giving the interns a chance to work throughout the parks system. The obligatory Gunnera shot that us east coasters can’t resist. 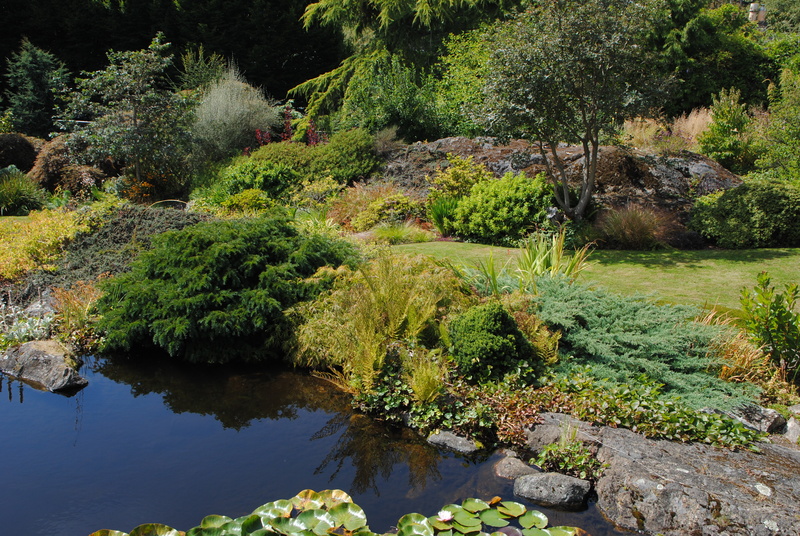 The surrounding Queen Elizabeth Park has a great arboretum but their quarry garden is the real showstopper. Since it can be viewed from above. 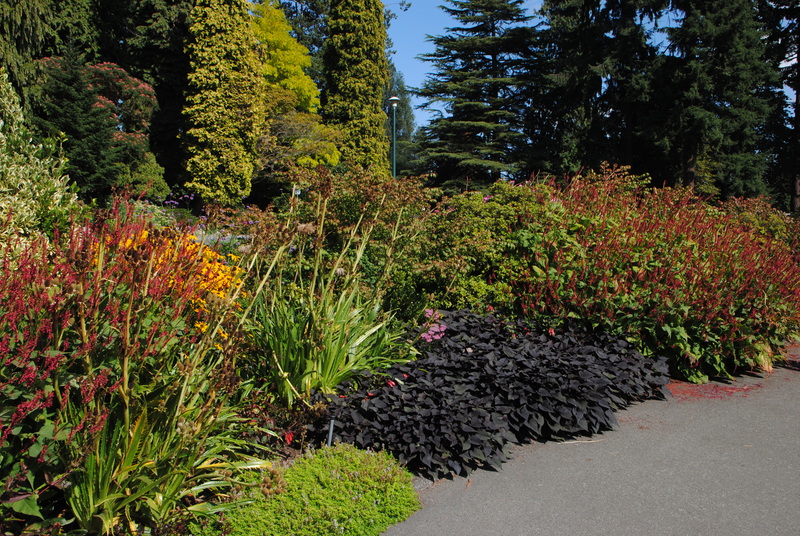 The colorful annuals, perennials, and conifers combine combine for a breathtaking display. The color and texture is great. 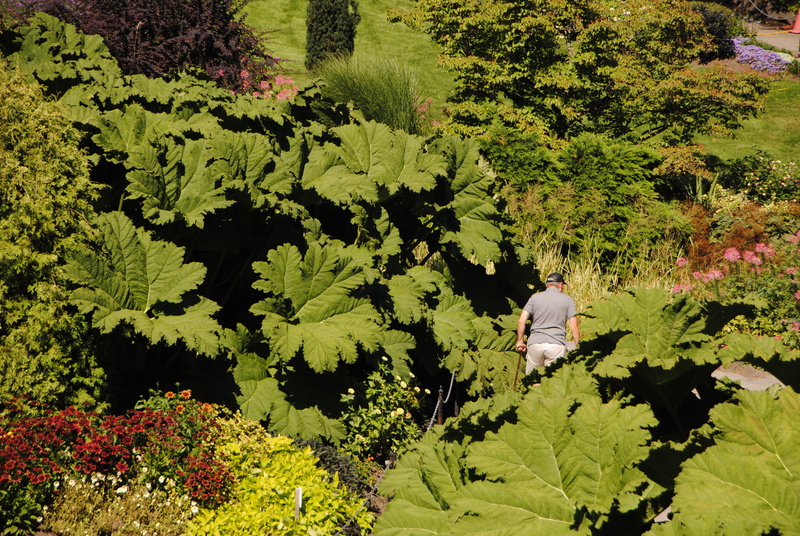 The incredible quarry garden at Queen Elizabeth Park viewed from above. I’m not sure the bike dates to the Ming dynasty. 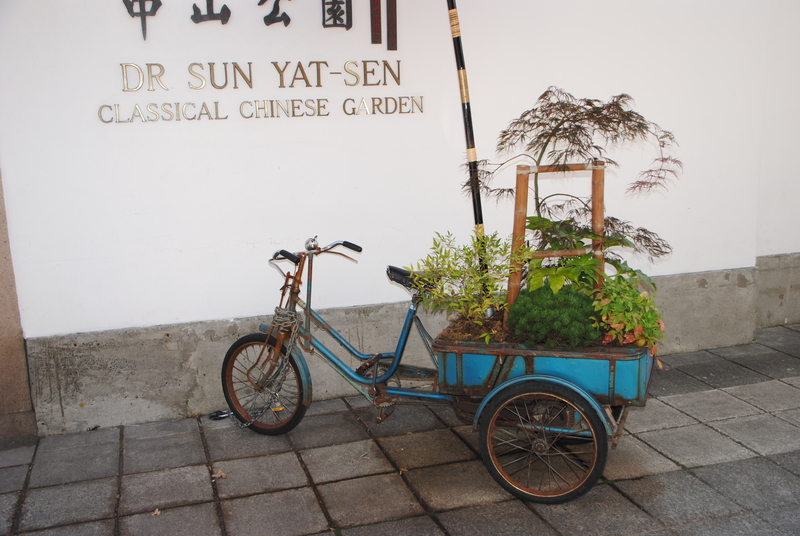 The final garden for the day was the Dr. Sun Yat Sen Classical Chinese Garden and Museum. Unlike the other gardens, our guide was not a plants-person instead Sue explained to us the life in a Ming dynasty (~1350-1750) scholar’s household. Our guide Sue was fascinating describing the symbolism of the garden and house. If you want to be happy for 1 hour, get drunk. If you want to be happy for 1 year, get married. If you want to be happy for a lifetime, get a garden. 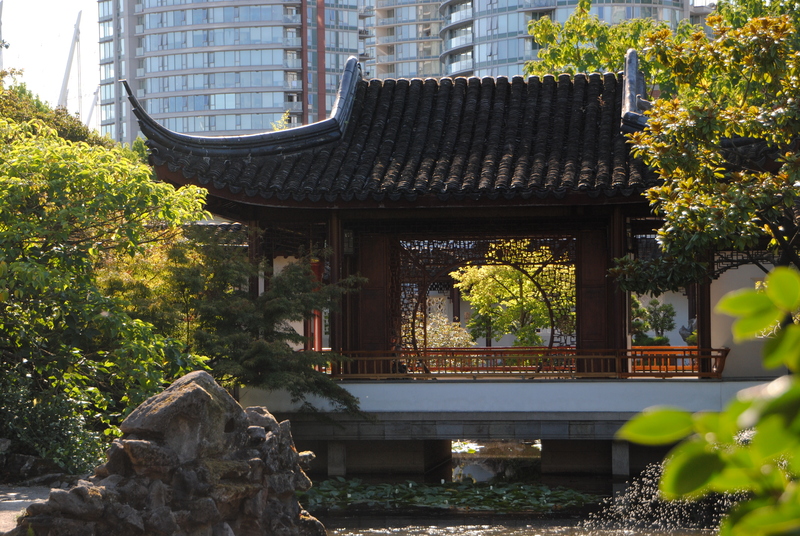 Dr. Sun Yat Sen Classical Chinese Garden is surrounded by the city. Stone, plants, water, and man-made structures are the four elements of a classical Ming dynasty garden. Since we were already in Chinatown, a dinner at a dim sum restaurant was a no-brainer. The Jade Dynasty served us a mountain of dim sum, barbequed duck, Chinese broccoli, mushrooms, and beef with tangerine rind. A fantastic end to a great day. 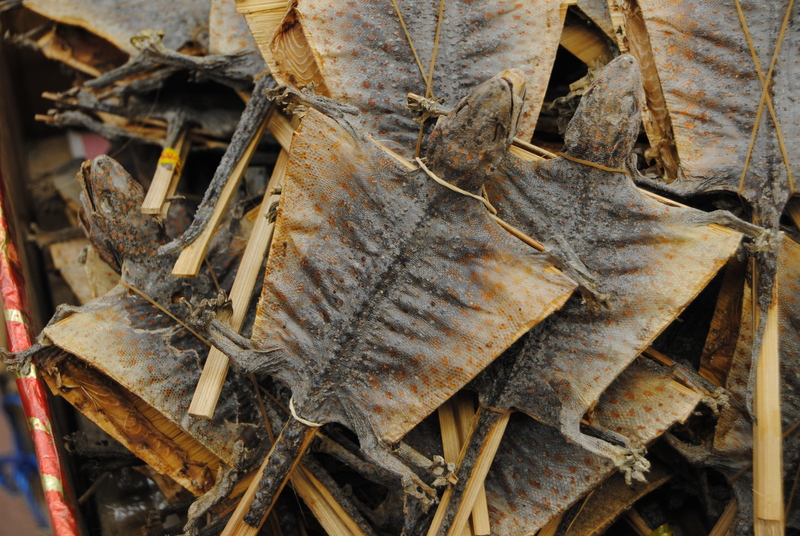 Dried gecko in Chinatown – no, they don’t eat it like a lollypop, it is used to make a tea. This entry was posted in Travels and tagged Bloedel Conservatory, Chinatown, Dr. Sun Yat Sen, Queen Elizabeth Park, Van Dusen Botanical Garden, Vancouver on August 21, 2013 by Mark Weathington. Douglas Justice educating our group about botany, geology, history, and even our own North Carolina plants. 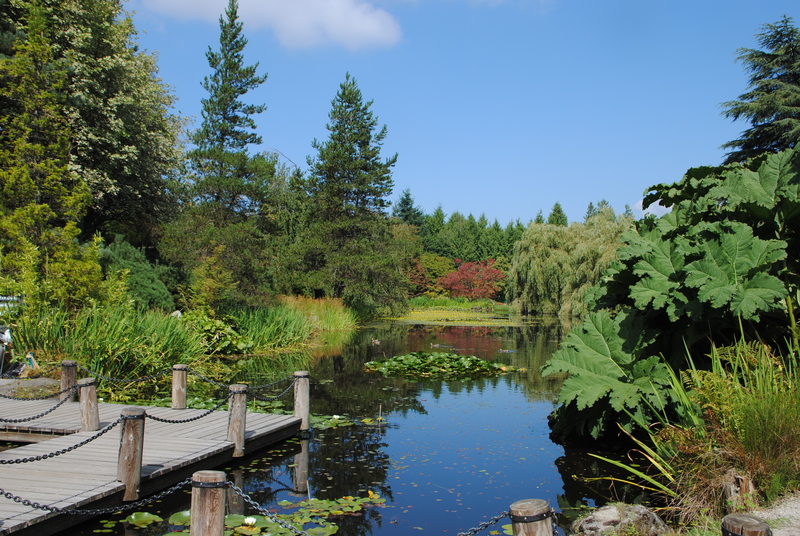 One of my absolute favorite gardens in the world is the fantastic collection at the University of British Columbia Botanic Garden. 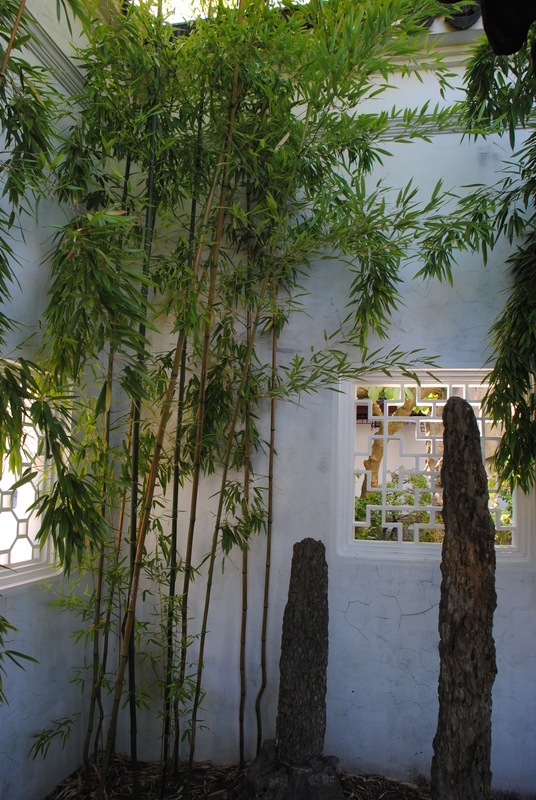 The heart of the garden is the Asian collection which is presented as a woodland garden with plants growing naturally and a fantastic display of vines climbing through the trees. Our group was very lucky that Douglas Justice, associate director, was available and willing to give us a tour. 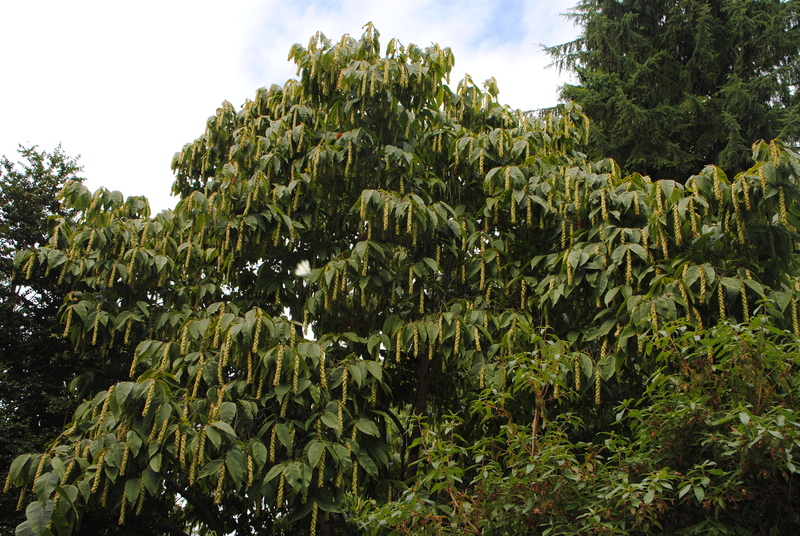 UBC’s famous specimen of Carpinus fangiana, newly christened ‘Wharton’s Choice’. 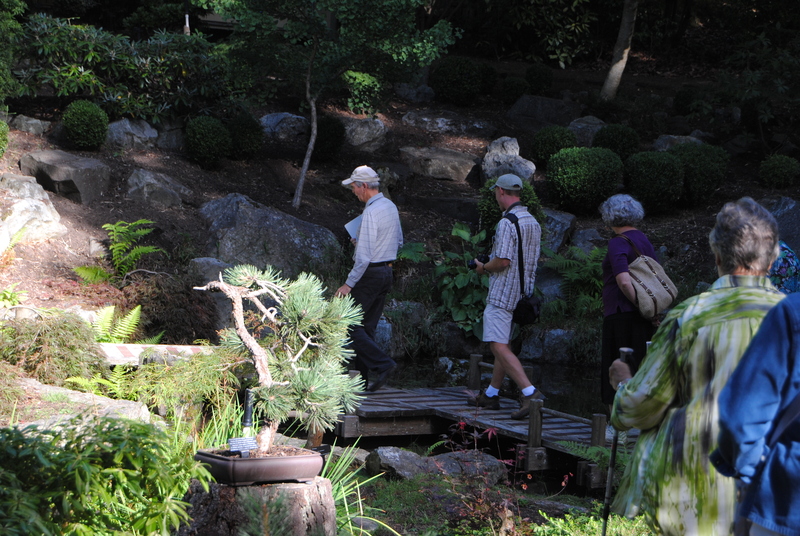 Douglas led us through the Asian collection, Carolinian forest, Alpine garden, and Edible garden. His 3-hour tour was one of the best I’ve ever had and the rest of the group echoed that sentiment. The collection, as always, was an education for me with new plants around every corner and all displayed under majestic native conifers. Ilex elmerrilliana was new to me. 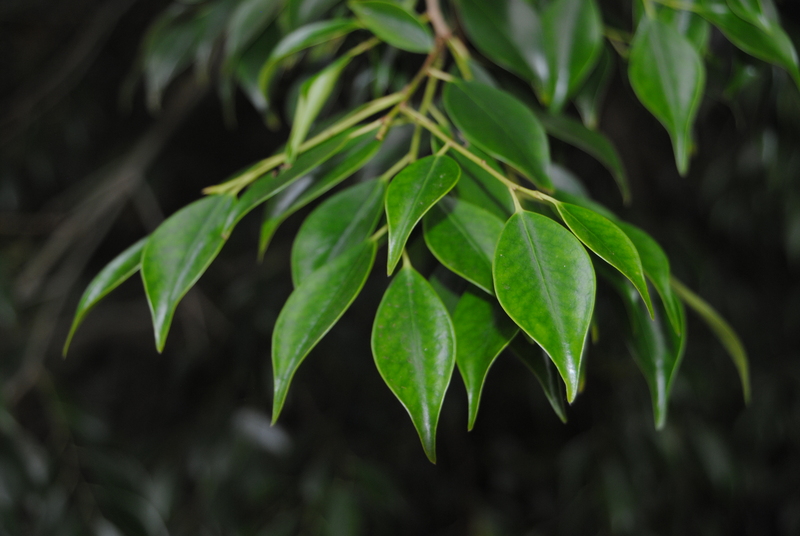 Paris polyphylla var. polyphylla growing lusher than I’ve ever seen it before. 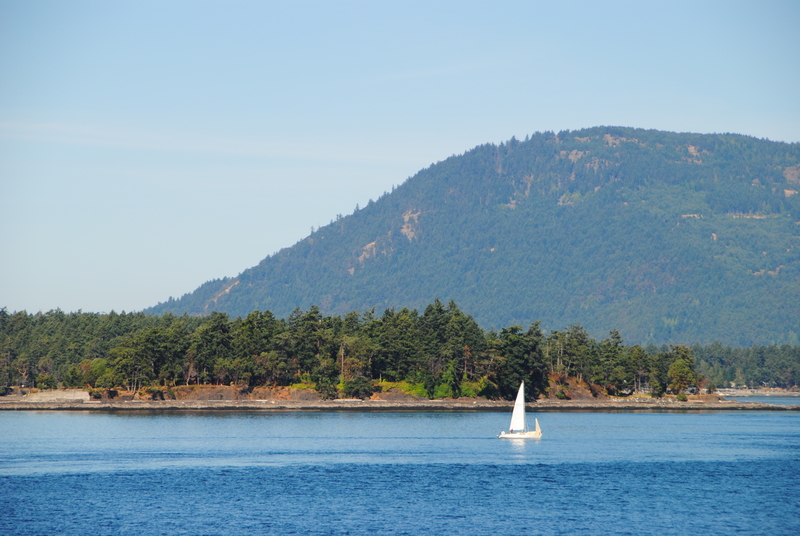 After a leisurely lunch at Vancouver’s famous Fish House, we explored Stanley Park which is situated just north of the hotel on a point of land. 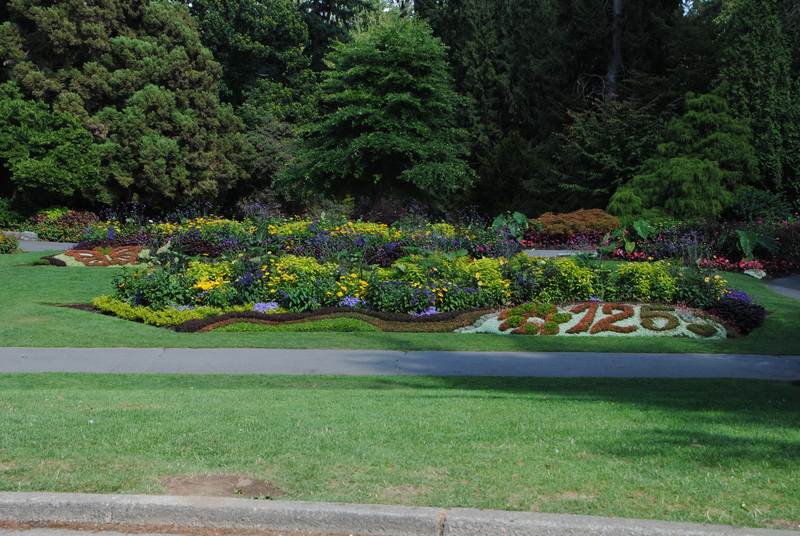 Stanley Park is celebrating its 125th anniversary and the gardens looked great. 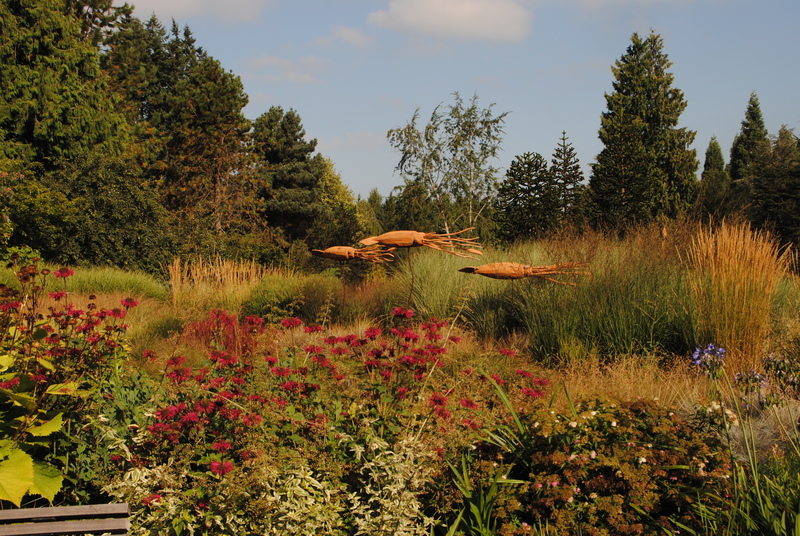 There were some surprisingly spectacular perennial and mixed borders as well as some fantastic annual displays. 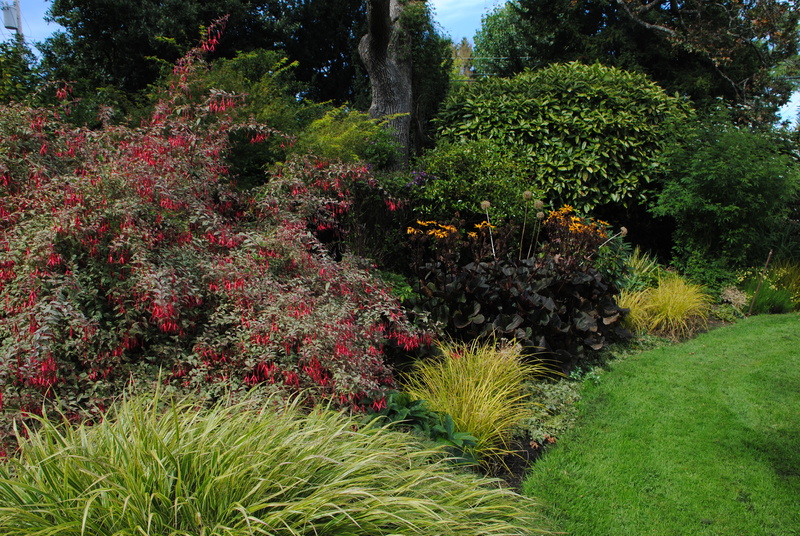 Gorgeous borders at Stanley Park. 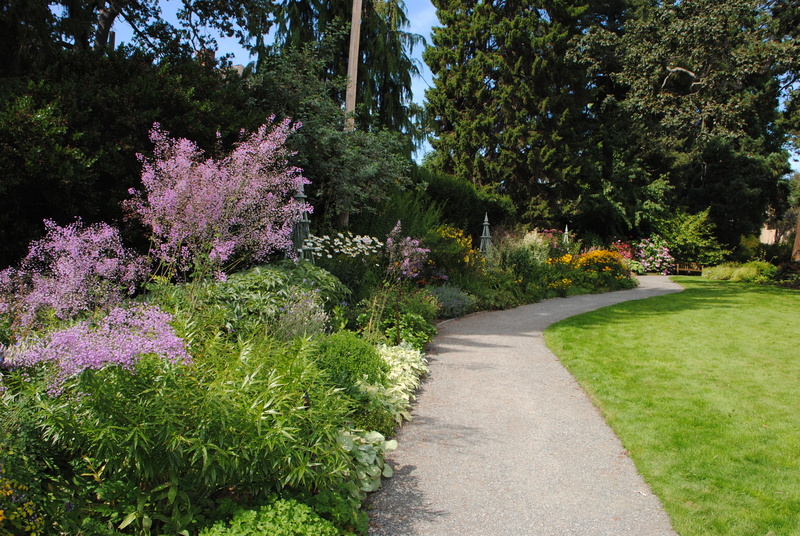 Stanley Park is celebrating its 125th anniversary. The backdrop of conifers makes every view even better. 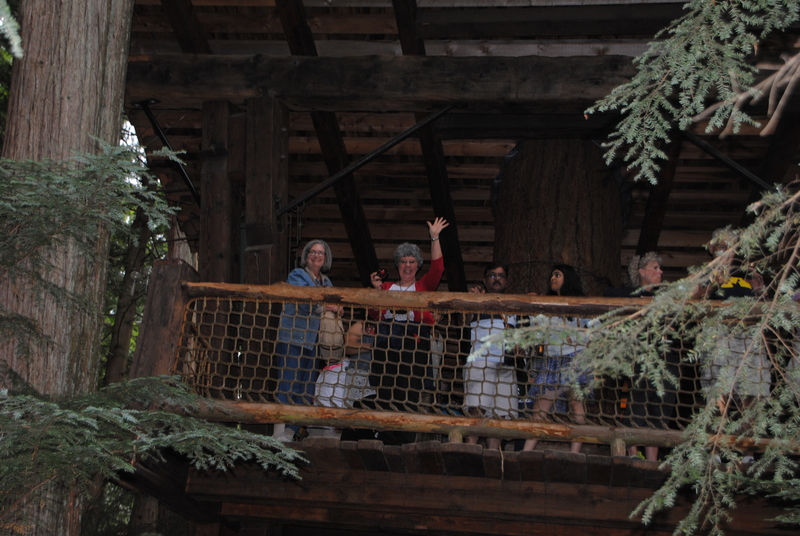 Marty Howard standing beneath a weeping Sequoiadendron. 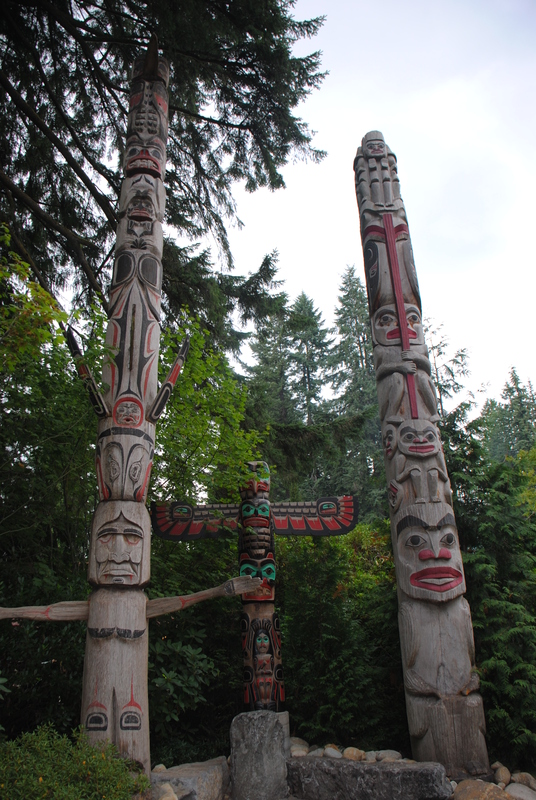 One of the highlights of the park are some authentic First Nations totems. Each carving tells a story or describes a lineage of a family. 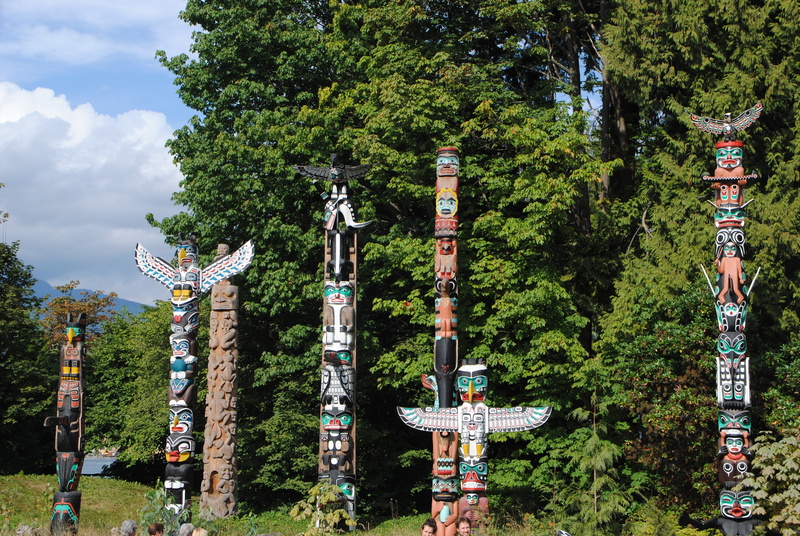 A good looking group at the First Nations totem poles. 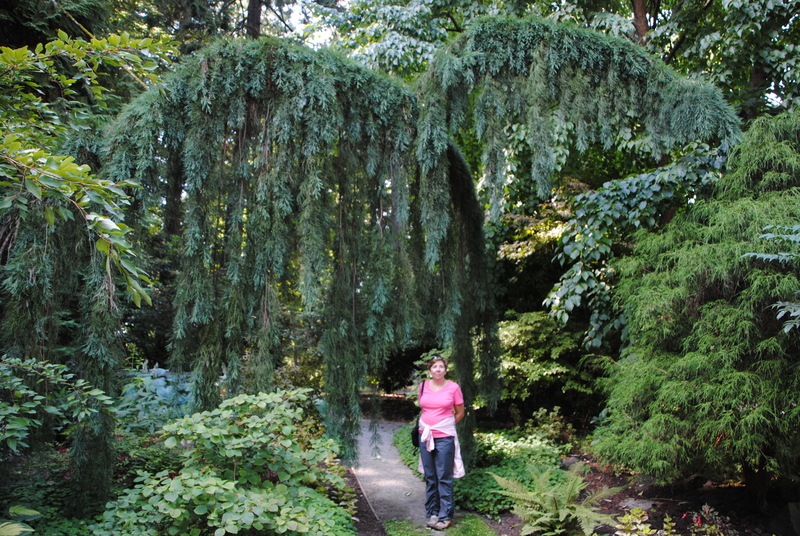 This entry was posted in Travels and tagged douglas justice, Stanley Park, UBC botanic garden, Vancouver on August 20, 2013 by Mark Weathington. 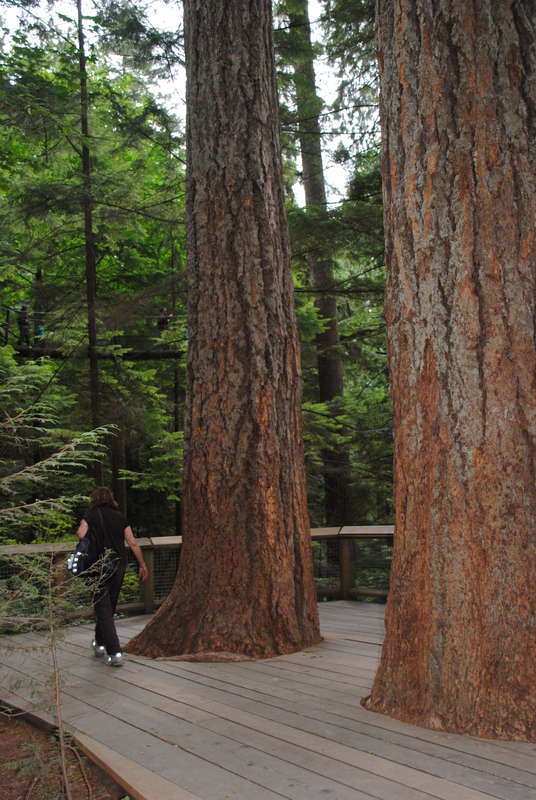 Totems at Capilano Suspension Bridge. 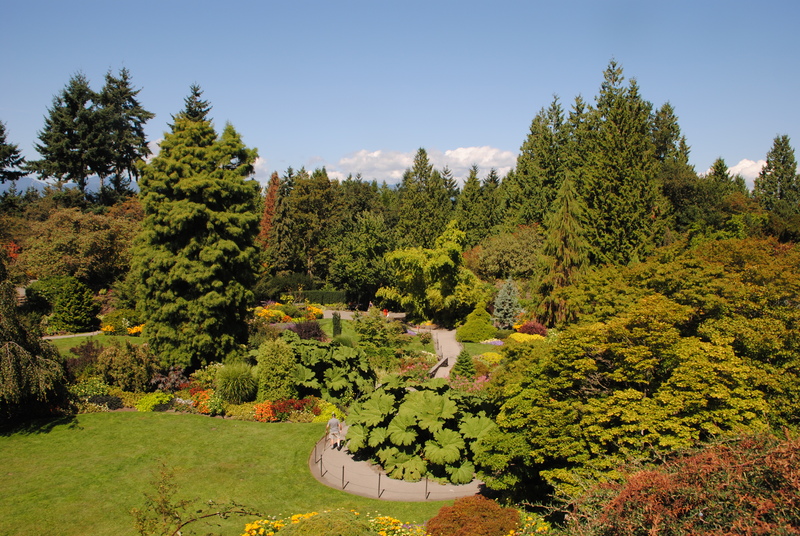 One of the meccas for plant lovers has to be the beautiful region around Vancouver where you can find the rare temperate rain forest, diverse botanic gardens, and beautiful displays. I’m currently leading a trip with a group of JC Raulston Arboretum members here to soak up the sights and we got off to a great beginning. 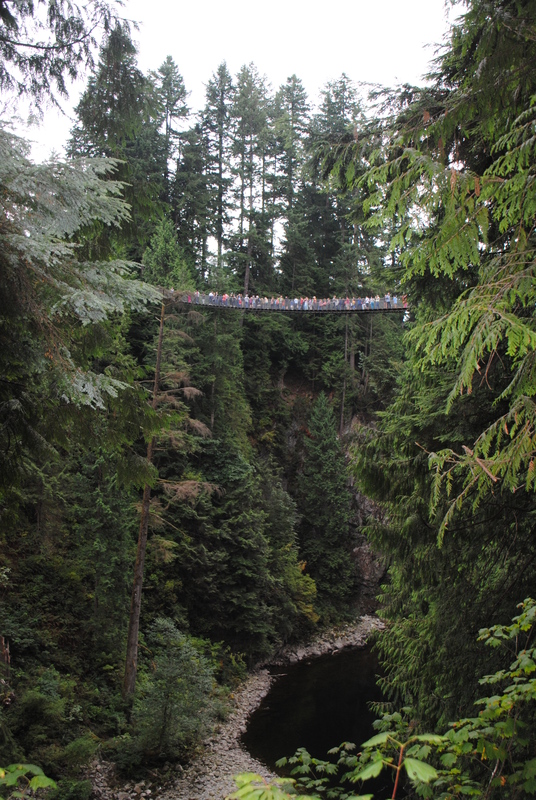 Despite a very early start, our first day turned out to be a great one with a visit to the Capilano Suspension Bridge. The old growth Douglas firs (Pseudotsuga menziesii), western redcedar (Thuja plicata), and western hemlock (Tsuga heterophylla) with its carpet of western sword fern (Polystichum munitum) and salal (Gaultheria shallon) was absolutely stunning in this extremely busy park. Nancy checking out some huge Douglas firs. 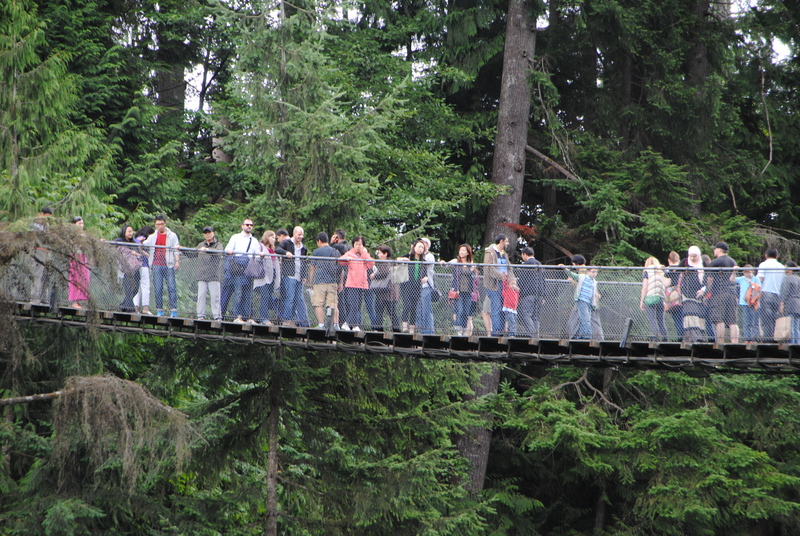 Part of the group entering the tree canopy walk. The gorge and suspension bridge. A close-up of the crowds. While the plants and scenery were gorgeous at the bridge, the crowds were a bit off-putting as were the $18 hamburgers. It is certainly worth a visit but I’d save it for a weekday rather than a beautiful Sunday. 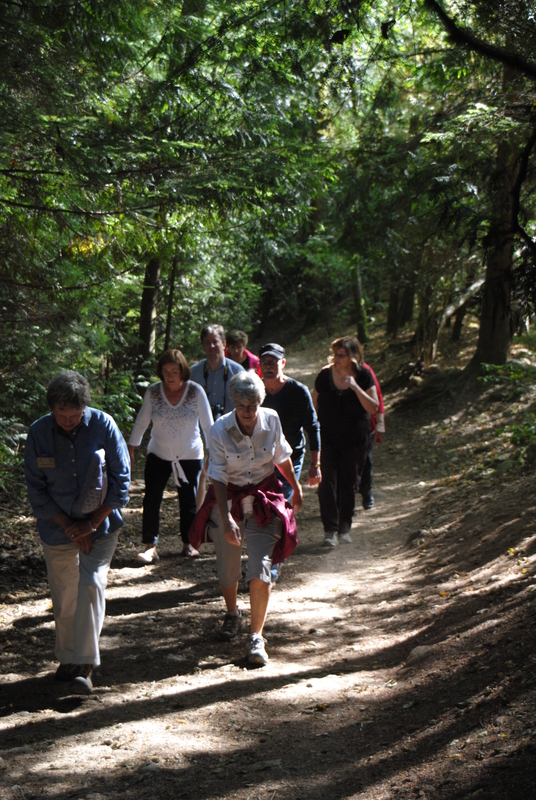 We took off for a small park in a residential area to see Cypress Falls. A short hike brought us to the falls and the deep ravine where it flowed down. A short hike brought us to the small but beautiful Cypress Falls. 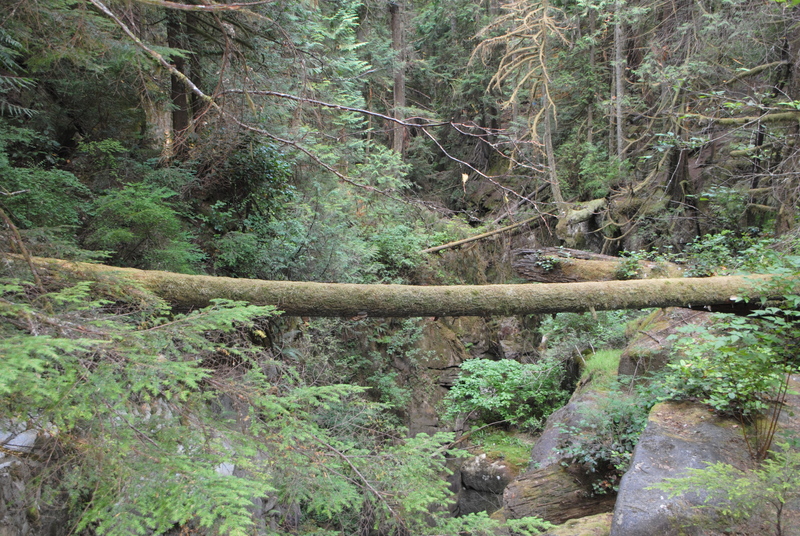 Moss covered log spanning the ravine over the falls. 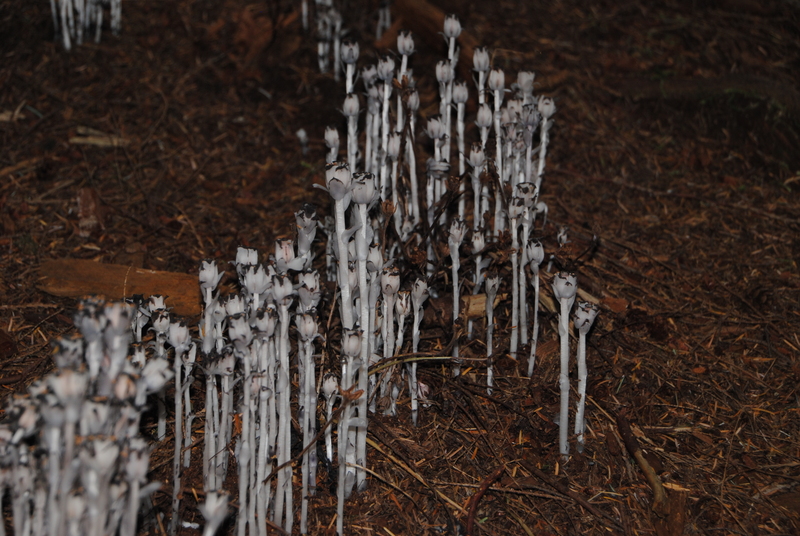 Monotropa uniflora is also known as Indian pipe or corpse flower. 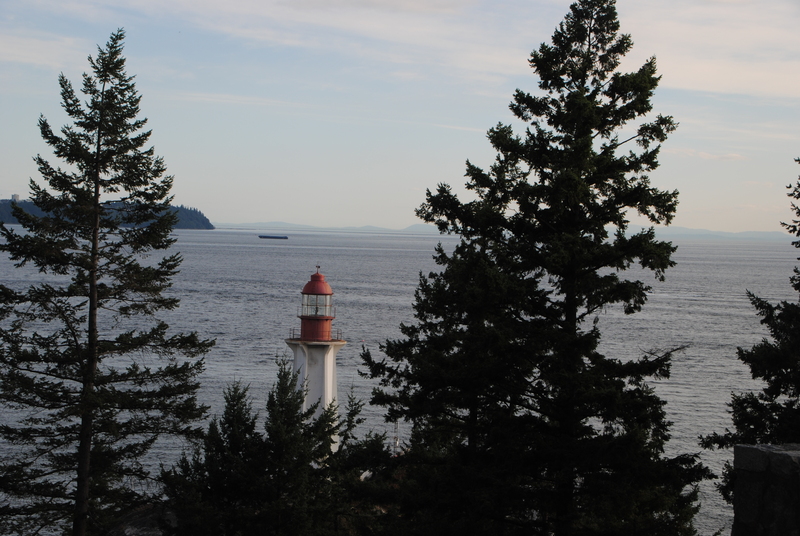 The day for the group ended with a visit to Lighthouse Park. The scenery overlooking English Bay and back towards Vancouver was the perfect punctuation to a gorgeous day. The lighthouse at Lighthouse Park. 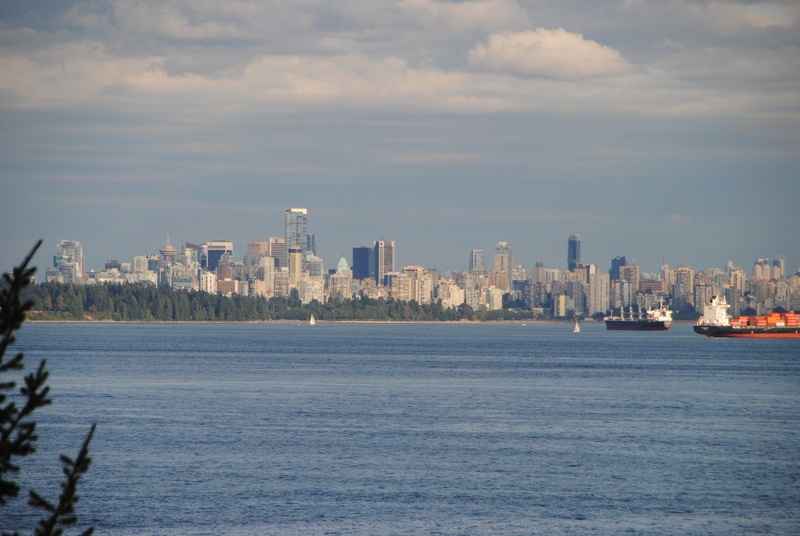 A great view of Vancouver to end the first day. I couldn’t convince anyone to join me for an evening run on Vancouver’s sea wall along False Creek and English Bay and they all missed out on a beautiful sunset over the coast. The sea wall was pretty impressive with big crowds of hipsters, hippies, retirees, young couples, families, homeless folks (although a few of them might just be hipsters), artists, and musicians. 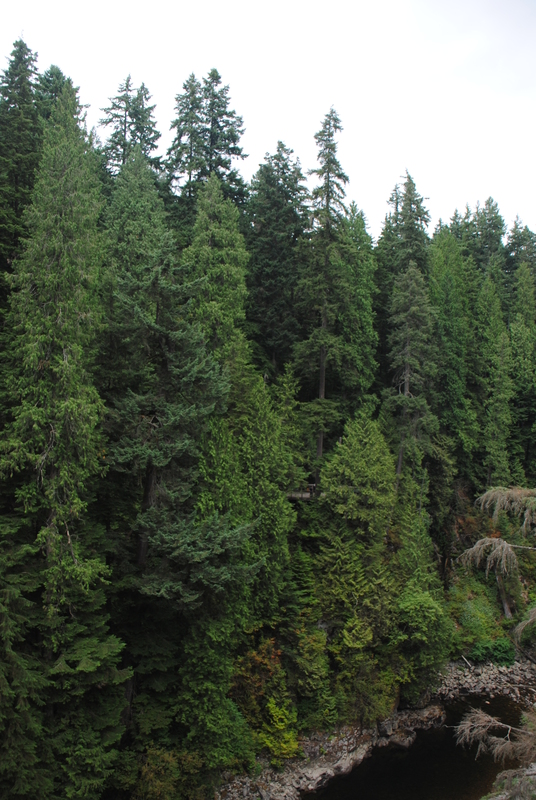 This entry was posted in Travels and tagged Capilano suspension bridge, cypress falls, lighthouse park, Vancouver on August 19, 2013 by Mark Weathington. Shipping plants around the world involves much more than sticking them in a box. The hardest part of a plant buying/collecting trip is getting everything back home safely. 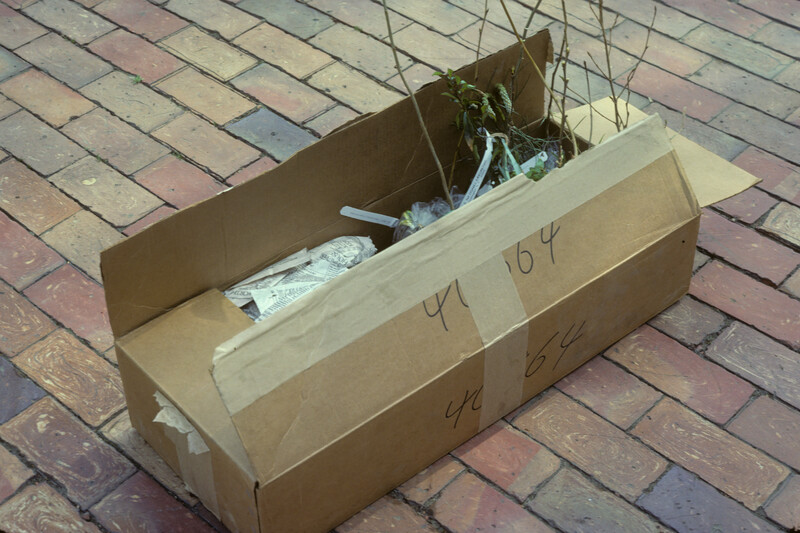 Whenever I give a talk about my travels the topic of importing the plants is always the first to come up – followed of course by “when will you propagate and distribute them?” We’ve had quite a lot of experience with this but the targets always seem to be moving. The first step is to apply for import permits from the US Department of Agriculture’s (USDA) Animal & Plant Health Inspection Service (APHIS). There are several types of permits so it’s a good idea to know what types of things will be imported. You should also know what is and is not allowed into the US from whatever country you are visiting. A constantly expanding list of plants not allowed for import is online and new regulations like the Not Approved Pending Pest Risk Analysis has created new lists and made it even easier to ban plants without real information on whether the plants pose a true risk. The only way off that list is for the USDA to perform a pest risk analysis on the plant in question. Somehow I don’t see that in the foreseeable budget of the USDA. In whatever country you are visiting whether it is Canada or Mongolia, all plants must be inspected and receive a phytosanitary certificate (phyto in the importer’s lingo) from the country of origin. 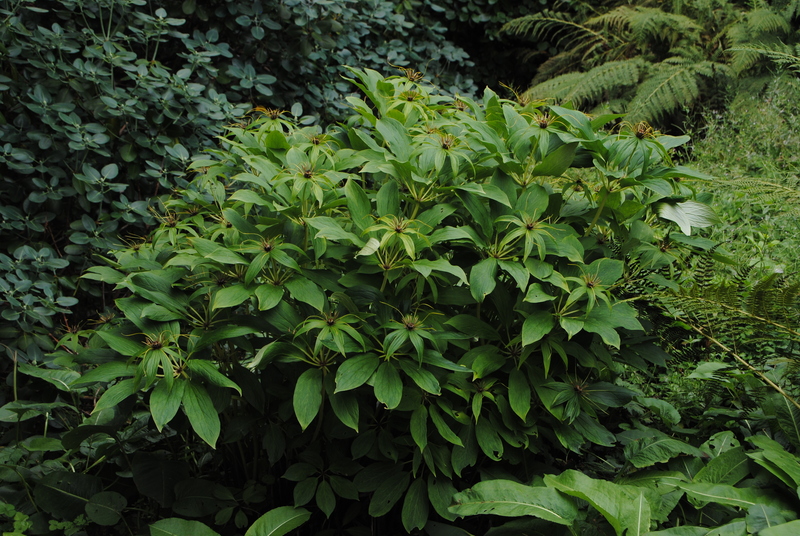 Plants and any plant parts must be free of insects and diseases (try explaining to an inspector that the variegated, contorted thing you got in Japan is really not diseased) and free of all soil. They must also be less than 2 years old and under 3 feet in height. Seed in small quantities – fewer than 50 seeds each of no more than 50 different types of plants – can be shipped into the US without a phyto as long as you have the correct permit. Many countries do not give phyto’s so this is the only option for some regions. When you get everything together, plants and seed must all be shipped to a USDA inspection station like Atlanta, New York, Miami, or Seattle. After a clean bill of health they are shipped on to you. If all goes as planned, from the post office in the other country to your door can be as little as 4-5 days. It can also be 4 weeks if the package gets held up somewhere. Of course if the APHIS inspectors find a problem with your shipment they can destroy all or part of the plant shipment. Finding plants is easy, getting them by the bureaucracy legally, through the post safely, and growing at home successfully is the difficult part of the process. This entry was posted in Travels and tagged betula utilis, john grimshaw, quercus semecarpifolia, yorshire arboretum on August 16, 2013 by Mark Weathington.